We are Foodies. We love to explore new restaurants and keep current with old favorites and recommend them to our guests at the bed and breakfast. And so we set off last Wednesday with good friends to enjoy a warm dinner out on a cold winter night. We discovered the Birchrunville Store Café five years ago and it has become one of our absolute favorites. It is hidden away on a country road, deep in Chester County – but you will swear you’ve arrived in the French countryside. 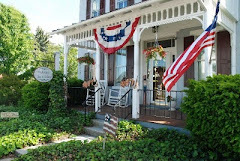 It’s actually only two turns and about 40 minutes from our inn in Lancaster County and well worth the drive. The restaurant is set in an old general store, its green paint well weathered, and inside window sills filled with corks from many happy diners. The front of the building is also home to the local post office. A stream behind the restaurant provides a backdrop for the lucky few who get to dine on the patio. This small, intimate café is a place to fall in love-or fall in love again - either with someone, with the food, or with both. The glow of dozens of candles, the ring of wine glasses as they meet in a toast, and the warm oranges and reds of the French (or Italian) countryside wait for you inside. There’s a black and white whirl of a very pleasant (but not at all snooty) wait staff that delights in explaining the menu and describing the specials. And it seems there are usually more specials than one can remember. The only tough part is the decisions on what to order. My appetizer of goat cheese soufflé with a warm truffle center balanced the plate perfectly between the cream and color of the soufflé and the crisp bite and bright green of the arugula salad. As you can see, Bruce’s appetizer of smoked salmon, avocado, jumbo lump crabmeat napoleon with Japanese seaweed salad was a work of art, and Rich’s Romaine Salad wrapped in Parma prosciutto was just as impressive. The main courses were wonderful too, but the more wine we drank, the fewer pictures I took. But everything, from the veal tenderloin with chanterelle mushrooms to the black angus strip steak, the quail and the rack of lamb were all delicious. You can see the descriptions and full menu on their website. We were thrilled when we convinced the Chef and Owner, Francis Trzeciak, to make a rare appearance before our camera – many thanks to Jennifer, our waitress, for making this photo possible! Having grown up in France and then spending time in Italy, the chef has brought the best of both worlds to this little corner of America. So, the next time you plan to visit The Artist’s Inn, we recommend that you ask us to reserve a table for you at Birchrunville Store Café – but don’t wait too long. They are open just four days a week and only for dinner. Saturdays are already booked through the end of May. Hey, that sounds like a good excuse to visit us on a weeknight and take advantage of our March coupon of 25% off any stay Sunday through Thursday nights. In case you missed our newsletter, you can sign up on our website. If you’d like to take advantage of our coupon, just mention it at the time of booking. The Cafe suggests that you bring your favorite wine and they will happily pour for you, but leave your credit cards at home – this is a cash only restaurant.